Canadian Finance Minister James M. Flaherty called the U.S. financial rescue “less than clear,” echoing comments made by financial chiefs in France and Germany. 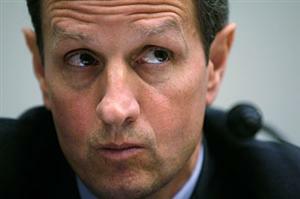 Afterward, many of the officials appeared reassured, saying that Geithner provided clear answers to their questions. Several officials said Geithner was particularly helpful in explaining how the various elements of the administration’s initiatives tie together as well as how he plans to combine public funds with private resources to get more bang out of every rescue dollar the governments spends. Withholding critical details was a conscious choice by Geithner and his team, the official said in an interview. They wanted to avoid the mistakes of the Bush administration, which announced proposals before fully debating them and then quickly abandoned them when it realized they would not work. Geithner and his staff also wanted to coordinate their proposals with lawmakers, the private sector and their counterparts overseas. This need for coordination is more than just rhetoric, officials said. If the United States develops a method to examine the books of banks and evaluate the real worth of their assets, it would likely affect financial firms around the world. So let me get this straight. The story we’re asked to believe is that Geithner deliberately mumbled his way through Tuesday’s press conference, but then, four days later, working from “a few pages of notes that he had quickly scribbled in a small notebook,” provided a brilliant explanation of his plan that satisfied the most sophisticated economic audience on the planet? What’s wrong with this picture?